Regarding your article on using a multimeter ["Using a Multimeter"], you suggested that it would be better to purchase a meter which would do multitasks rather than a cheap meter - functions such as duty cycle, pulse width, rpm, temp and continuity. Would you be able to recommend such a meter for me and where I can purchase the unit? 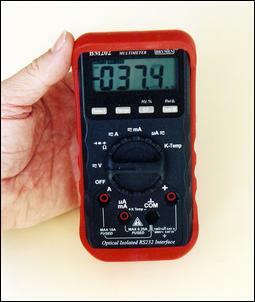 We've reviewed a competent general purpose meter here ["Product Review: The Brymen BM202 Multimeter"]. I read with interest your articles regarding the temperature sensor(s) in AutoSpeed and was wondering if you can help me with the following problem. As per your "TempScreen" articles [starts at "TempScreen: Part 1 - Installing the Intake Air Temp Probe"], I have a temperature sensor (thermistor) that is sending a higher voltage to my temperature readout than it should. Thus, when the air temperature, for example, is 30 C, my readout states 42 C. Question: What do I use to reduce the voltage going to the temperature readout? The readout is a in an overhead console. I also tried switching thermistors and the result was the same: higher readout temp than actual air temperature. The therrmistor is not located near a heat source. Thank you for your help. The TempScreen doesn't use thermistors, it uses K-type thermocouples. Are you using the right sensors? When are you coming out with the water injector controller? We have one that is about 90 per cent developed, and we would expect the article to appear in the next few months. Why would you wrap the exhaust after the turbo? Keeping the exhaust gasses as hot as possible would increase back pressure wouldn't it? (P=nRT/V from chemistry says that keeping the volume constant (as in an exhaust pipe), the pressure increases with increasing temperature!) I'm assuming a heat shield is not practical in this instance as it makes no sense to wrap the exhaust after the turbo! Great stories on the SCV and Peter Gumley ["Australia's Hillclimb Champion"] and ["Hillclimb Hero"]. He has done very well. Certainly turned a "sow's ear into a silk purse". His performances over the past 6 or so years have been a great credit to him and his team. One point I would like to make is that the only "sophisticated, imported car" he has beaten (aside from Roger Harrison's fairly antiquated, 70's designed Tiga) is the Pilbeam MP 62-Vauxhall which I imported to co-drive with former British Champion, Alister Douglas-Osborn at Bathurst in 1996. That car was powered by a normally-aspirated 2.0 litre engine with 260 BHP. Even then the difference in our best times was only 0.07 seconds in about 24 seconds for the climb up the "Esses" course. Sure, Pete won fair and square but we had him sweating with a car whose power to weight ratio was in the order of half that of the SCV and that on a hill which demanded plenty of horsepower. My own March 77B-Cosworth could hardly be called a sophisticated design, being a British Formula 3/Formula Pacific car which first saw the light of day in 1977. The suspension geometry is almost identical to that of the SCV: parallel lower links, trailing arms, outboard Koni 8212 shock absorbers at the rear with conventional wishbone, outboard Konis at the front. The March weighs 608 kg on the line, 100 kg more than the SCV thanks to the VW engine and Peter's careful weight-reduction campaign on the car. The March's cast iron block water-cooled 2 litre Cosworth YBM (Ford Sierra) engine puts out 495 BHP and has about 360 ft/lbs of torque on Methanol. Yet, despite this handicap, it reels off 0-100 times in the mid-2 second bracket. The March and I have taken third place outright in the Australian Hillclimb Championships in the last three years. We have always finished less than a second behind Peter and the SCV. Eric Barnes, who has since sold his Farrell Toyota, seemed to be just that little bit faster than me and yet not quite capable of leading Peter when it mattered for the AHCC. I have been working on developing the March and have been slowly lowering my times at most venues. The car is currently with Ivan and Dean Tighe in Queensland having its camshaft profiles and timing looked at. Ivan feels there is some considerable room for improvement to make the car more driveable. It is too much like a light switch as it stands. This was a problem which Peter Gumley had to overcome. I have not yet invoked the March's Motec traction control. The only time I tried it the car destroyed a C.V. joint. I have since found out that this was due to the axle slipping over a circlip which allowed the balls of the CV to slip out of the outer track. "S..it happens" as they say. The meticulous notes which I keep of every outing show that the last comment is "Sell car". I embarked on a search to find something with which I could hold a candle to Peter Gumley and, just maybe, allow me to capture the AHCC crown after a pair of seconds, a hat-trick of thirds and sundry other places in what will be 10 years of trying this year at Grafton in September. I really wanted a Pilbeam. 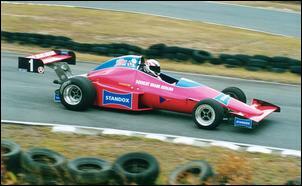 Roy Lane's MP58 with 4.0 litre F1-derived Judd V8 was available in England. The price was just beyond what I could reasonably justify. This car would be the "killer ap" for years to come despite the view of some to the contrary. A Pilbeam MP62-Hart 2.8 was available and I negotiated a very satisfactory deal with the Irish owner. I also thought the March was sold. Both deals fell through at the 11th hour. The Irishman sold to a Scotsman for cash on delivery for more than he had agreed with me. My buyer was a tyre-kicker of the highest order who makes a habit of leading people on, so I have since found out. So it is back to the drawing boards. A co-drive with one of my students in one of my Racing Drivers' School Formula Fords at the June round of the NSW Hillclimb Championship allowed me some time to observe other competitors' techniques. I learned a great deal. Pity I haven't done this before, but have always been too busy with my own car. The Copmanhurst Shire Council AHCC at the Grafton Sporting Car Club's Mountainview Hill on September 13, 14, 15th will be closely fought. Peter Gumley heads the tote but former Australian Hillclimb Champions Ivan Tighe and John Davies will join the fray to put up some strong opposition. I am confident that the March-Cosworth will help me be a worry, too. 1) Do know anything about ODBII, or have any tech info about it? 2) Do you have any info about how the electronic throttle control works on a Nissan X-Trail ? ie interface a cruise control, or idle-up mode (like hand throttle for off-road work) I read your excellent "Nissan's New Engineering" article. A quick web search will turn up lots of information on OBD II, including dedicated readers of the information stream. We have done several general articles on electronic throttle control, with the most recent being ["Electronic Throttle Control Advances"]. We don't have any more information specific to the Nissan system. Secondly re the reader's letter regarding the use of exhaust heat wrap on his turbo Silvia. I've had to replace both custom made exhaust manifold (mild steel thick 'steam pipe') and exhaust dump pipe (again mild steel)after only two or so years and they were both heat wrapped! Recently also replaced the exhaust housing on my turbo (T04B) as that was eroded away internally and flaking away on the external surface. That was also heat wrapped in a special turbo bag. The items were on my RX-7 12A turbo motor which only travels say 5000 - 8000 k's per year, mostly gentle, but some very hard (supersprints, hillclimbs etc). I can't verify if heat wrap will damage stainless pipework on a piston turbo engine, but I can say that I will never use it again due to the expense and spanner work in replacing all the above items! I now use s/s heat shielding instead, but I would say that the heat wrap is ultimately more effective if you can get the components to last, or can afford to keep replacing them. I've just renewed for another 2 years. I don't get to look at AutoSpeed as often as I like, but you get that. I can sort of get net access at work now, so that's better for me!!! From one of the silent majority, keep up the good work boys. Damn top value, and Aussie too. Don't need anything more than that! And keep up the stories about the old cars done up well, not all of us can afford the latest ToySubMitsu XRV-007Yi. 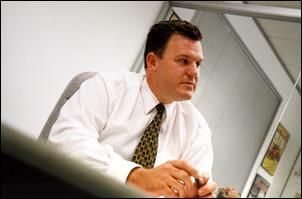 I liked your article with John Clark ["Talking with HSV's Chief Engineer - Part 2"]. Our Gen 3 uses a HUGE amount of oil, and tyres only last 15-20km until the camber wears the insides. It seemed like the questions on engine damage 'rattled' him, and then he lost it, was he a bit nervous after being 'beaten up', rather than the usual PR style 'when are we going for lunch' questions he would normally get. Any requests to pull the article, or modify it after publication? "We've mentioned HSV's ECU reprogramming - what sort of specific changes are made? ...Our calibration guy goes out and spends about three days testing at the proving ground with his counterpart from Holden...."